After two years, free AOMEI PE Builder finally updated to 2.0. In this new version, AOMEI PE Builder added double-boot mode supported function. Now the WinPE bootable media created by you is compatible with both old BIOS and new UEFI so that you don’t have to create two medias for those two boot modes separately. We suggest you to create WindPE relies on 64-bit system above Windows 7. 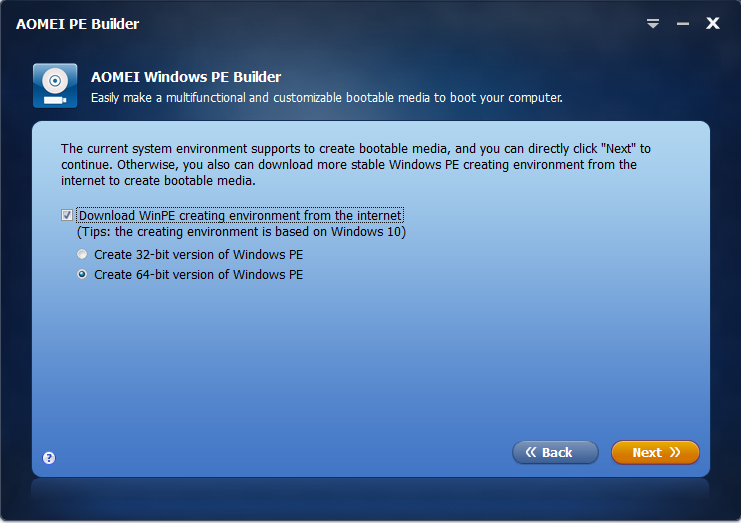 What’s more, AOMEI PE Builder 2.0 supports more operating systems, especially Windows 10 and Windows XP, Vista. The total OSes supported by 2.0 are from Windows XP to Windows 10 and Server from Windows 2003 to 2016. Let’s download and try the new one. Install and run it. Its first interface has no change but the second interface has. In the former version like 1.5, the second step is detecting system environment. Now the latest version provides choices. Because 2.0 supports to download Windows 10 recovery environment to create a Windows PE bootable media. If your system is Windows 7 or Windows 8/8.1, you can select to download either or not. If your system is Windows 10, you have to download it, select 32 bit or 64 bit. In the third step. New version updated some built-in tools. 2.0 has utilities are 7Zip, Everything, Imagine, Notepad 2, Q-Dir, Recuva SumatraPDF, PENetwork, QtWeb, BOOTICE, CPU-Z, OSFMount. Forget one thing, old version of AOMEI PE Builder integrated free partition manager AOMEI Partition Assistant and AOMEI Backupper already. 2.0 you can select to download the installation package. The bigger one contains these two AOMEI products as well while another small size one does not contain them. The forth step, bootable medias are the same as before, burn to CD/DVD, USB device, export ISO file. Choose a one and then start to build. 2.0 version allows you to to cancel the operation during the process of creating a Windows PE bootable media. In a word, 2.0 of AOMEI PE Builder is more compatibility, flexible and stable. Use it earlier will help you a lot when you come into question with computer. Related to "AOMEI PE Builder 2.0 Review"